NEW DELHI — Narendra Modi was sworn in as India's prime minister in an elaborate ceremony at New Delhi's presidential palace on Monday, after a sweeping election victory that ended two terms of rule by the Nehru-Gandhi dynasty. Millions of Indians watched the inauguration live on television as the 63-year-old Hindu nationalist leader, once thought of as too divisive to lead the world's largest democracy, took his oath along with his cabinet members in the palace forecourt. The low-caste son of a tea stall-owner, Modi won India's first parliamentary majority after 25 years of coalition governments, giving him ample room to advance economic reforms that started over two decades ago but stalled in recent years. Many supporters see him as India's answer to the former U.S. President Ronald Reagan or British leader Margaret Thatcher. One foreign editor has ventured Modi could turn out to be "India's Deng Xiaoping", the leader who set China on its path of spectacular economic growth. Modi said the election had delivered a mandate for "development, good governance and stability." "Together we will script a glorious future for India. Let us together dream of a strong, developed and inclusive India that actively engages with the global community to strengthen the cause of world peace and development," he said in a statement. 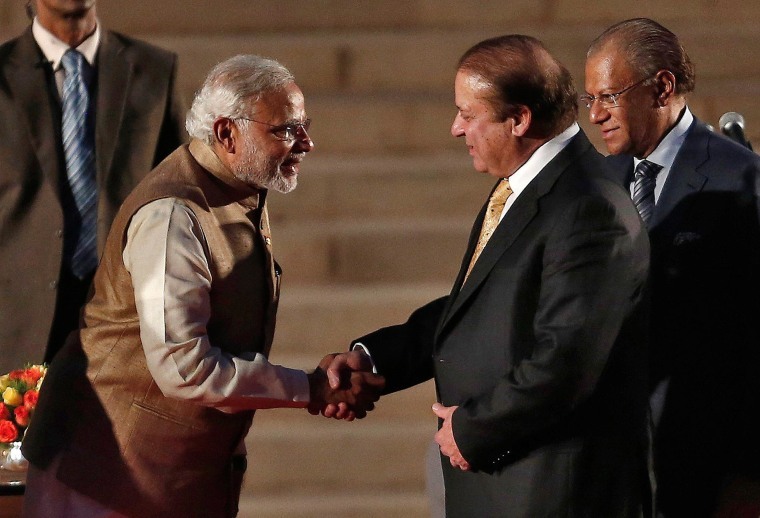 Modi invited leaders from across South Asia to his swearing-in ceremony, including Prime Minister Nawaz Sharif from rival power Pakistan, an unprecedented gesture. Even before his inauguration, Modi had some recognition abroad, treated by many with suspicion - and by some as a pariah - for Hindu-Muslim violence that erupted 12 years ago in Gujarat, the western state he ruled. The U.S. administration denied Modi a visa in 2005, but President Barack Obama has now invited him to the White House. He has spoken with the presidents of the United States and Russia and he has become one of only three people that Japanese Prime Minister Shinzo Abe follows on Twitter. The pomp unfolded as the summer evening closed in at Rashtrapati Bhavan, a colonial-era sandstone mansion with 340 rooms in the heart of New Delhi. Looking on were some 4,000 guests, ranging from members of the defeated Nehru-Gandhi family to top industrialists, Bollywood actors, Hindu holy men and the leaders of several neighboring countries. Supporters exploded fireworks in celebration a few blocks away at the headquarters of his Bharatiya Janata Party (BJP) after he was sworn in.